On the fourth day September, the generally accepted start of Spring, the Prince Albert Cultural Foundation hosted the first Water Indaba ever held in the town. The intention was clear – water is the lifeblood of the town and, deriving from a relatively small Dorps river catchment, is a precious resource under the pressure of a growing demand. The Indaba was an information­sharing session which highlighted the need for dialogue between all the role players about the present and future management of a scarce resource. To open the Indaba Mary Anne Botha clarified the role of water in underpinning the cultural life of Prince Albert, and indeed the very existence of the town. 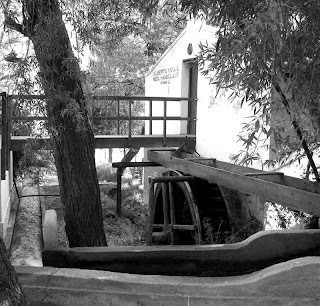 The course of the river and the alluvial plain from the time of Zacharias de Beer has created an imprint which still reads on the physical landscape, giving the town its unique character – a pattern of agricultural food production, the water erven, oasis­like in the context of the Great Karoo. Due to the resourcefulness of its founders, no external energy is needed to coax along the flow of water in the irrigation furrow – by gravity it reaches almost into every corner of the town's agricultural landscape. Recently the alignment of the 'leiwater furrow was charted by the Foundation for the first time! Until now its route along and under streets only existed as a mental map in the minds of the generations of townsfolk who have managed the water to serve the town's domestic and agricultural needs. If, in modern times, the way of life of Prince Albert is to be maintained, it is imperative that water not be alienated from the productive lands it has serviced for countless generations whether or not these are worked farmlands at present. Food security in the global context is a disturbing fact, only confronted if it is brought to the fore in local planning. The organising committee conceived the Water Indaba as an open session. Therefore, the Department of Water Affairs, the Prince Albert Municipality, Dr Ricky Murray of Groundwater Africa (and advisor to the municipality) and the Kweekvallei Irrigation Board (KIB) were all invited to respond to water issues. The contributions comprised a balanced picture of where Prince Albert stands today and will be in the future should the water resource be managed and administered well. Dr Ricky Murray is an expert in groundwater reserves and, as a consultant to the Municipality, has for the past few years directed current water practice regarding domestic and agricultural needs. The escalation in water demand has to a large extent been met effectively by the current water plan: domestic supply from boreholes drawn from natural aquifers which are recharged on a more regulated basis, and agricultural water fed through the historic 'leiwater' system, but with a more assured supply even during summer peak periods. The disturbing principle that "the Reserve (forming part of the Act) should not be at the expense of all development" means: in a critical water situation human consumption should take priority, which gives a different emphasis to the issue of priority. The Indaba yielded some useful pointers on current policy and interaction. Mayor Gay van Hasselt was pragmatic about the Municipality's reliance on outside expertise and guidance in its decision­making process. She invited assistance wherever it was relevant, for example, at the request from a participant from the floor, the contract for the proposed pipeline to the Poort would be made available for review. Mr Kallie Erasmus, the speaker on behalf of the KIB, explained that the Board carries out its mandate in terms of the historical legislation in terms of which it was constituted. It has no formal policies. Its current function is to maintain the furrow system and manage the existing water rights – 'leibeurte'. The fact that current ad hoc decision­making on matters of equitable water distribution and management does not serve the community well. Serious scenario planning holds the key to the way forward. The projected saving of water after the installation of the long–awaited pipeline from the off­take in the mountain to the waterworks outside the town needs to be distributed equitably to serve priority needs after consultation with the community. A solution has to be found for the unaccounted for volume of water which is lost after the water reaches the waterworks. The ecology of the Dorps river appears not to be monitored or maintained on a regulated basis. A focussed management policy would need to address this shortcoming. Dr Ricky Murray is to be thanked for participating and bringing the Water Indaba to a close with the wisdom which goes with good stewardship. For the future he spoke of the need for a vision and urged all role players to develop a strategy, determine a threshold for development, use solid guidance, work towards what the community wants the town to be like in twenty years time. The Prince Albert Cultural Foundation would like to thank all the invited speakers, and all those who participated in this Water Indaba. The Foundation regrets that as a voluntary organisation it is not always able to afford to duplicate its functions in both languages. Water was the drawcard, which knows no language barriers, and the hosting of this Water Indaba should be seen as an important a start to a long term vision for Prince Albert.